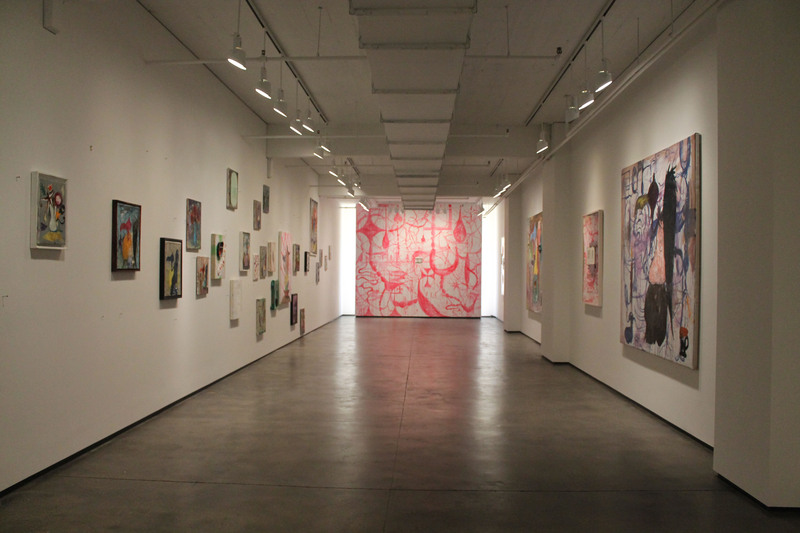 Tyler Rollins Fine Art is pleased to welcome back Manuel Ocampo for his second solo exhibition with the gallery, taking place from Nov. 8 – Dec. 22, 2012. Known for fearlessly tackling the taboos and cherished icons of society and of the art world itself, Ocampo has been a vital presence on the international art scene for over twenty years. 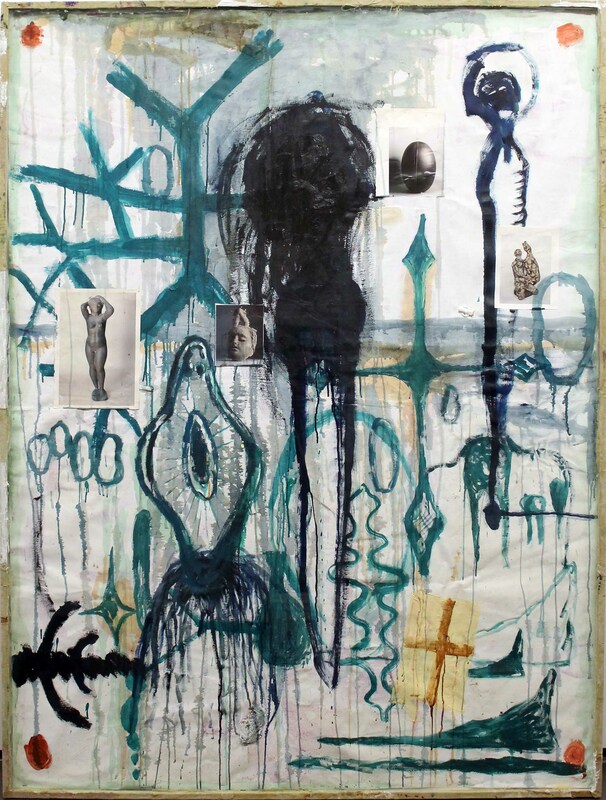 Based in California in the late 1980s and early 1990s, Ocampo had his first solo show in Los Angeles in 1988 and was included in the landmark exhibition Helter Skelter: L.A. Art in the 1990s, organized by Paul Schimmel at The Museum of Contemporary Art, Los Angeles, in 1992. 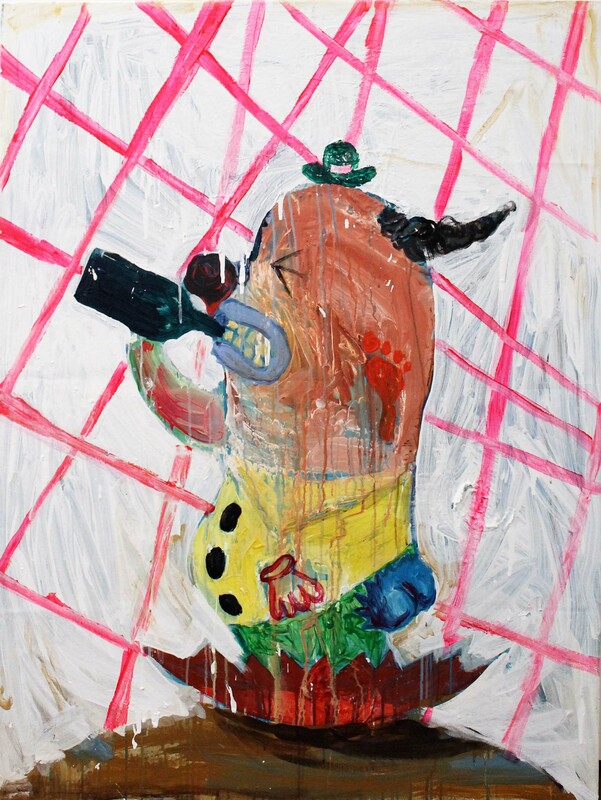 This year marks the twentieth anniversary of that exhibition, which is perhaps alluded to in Ocampo’s title for his current New York show: The View Through the Bull of a Manual Laborer of Menagerie Gussied Over White Ground: 20 Years of Self-Loathing and Intestinal Mishaps. 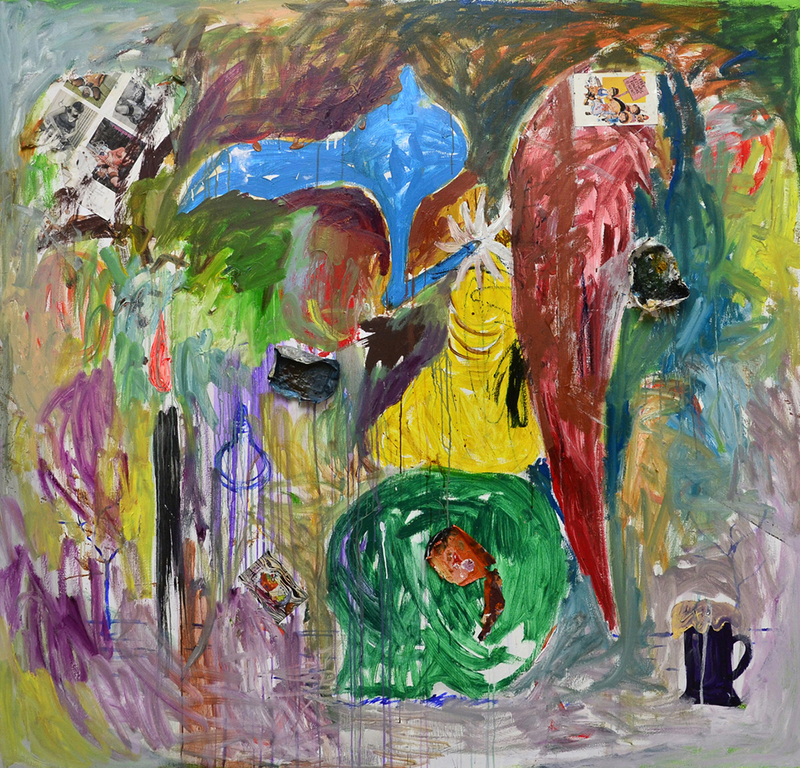 This year also marks the twentieth anniversary of the Asia Pacific Triennial (taking place in Brisbane, Australia, from Dec. 8, 2012 – April 14, 2013), for which Ocampo will present an installation of paintings that reflect on the evolution of his artistic practice over the past twenty years. Ocampo is currently based in Manila, in his native Philippines, but spends significant time working in the United States and Europe, particularly Germany, Luxembourg, and France. Ocampo’s reputation was firmly established in the early 1990s, with his inclusion in two of the most important European art events, Documenta IX (1992) and the Venice Biennale (1993). 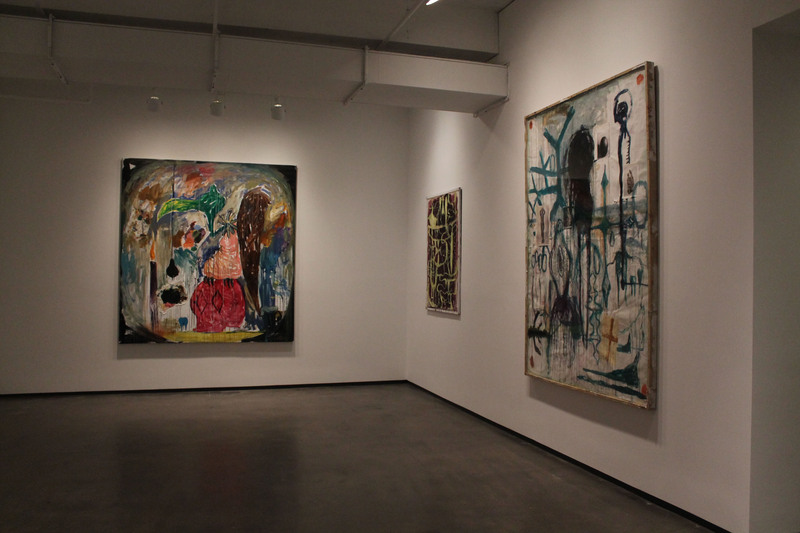 In addition to Helter Skelter, he participated in several international museum exhibitions at that time, including Individual Realities in the California Art Scene at the Sezon Museum of Modern Art, Tokyo (1991), and Jean-Michel Basquiat & Manuel Ocampo at the Henry Art Gallery, Seattle (1994). He has subsequently participated in numerous museum exhibitions and biennials around the world, including the biennials of Gwangju (1997), Lyon (2000), Berlin (2001), Venice (2001, his second showing there) and Seville (2004). 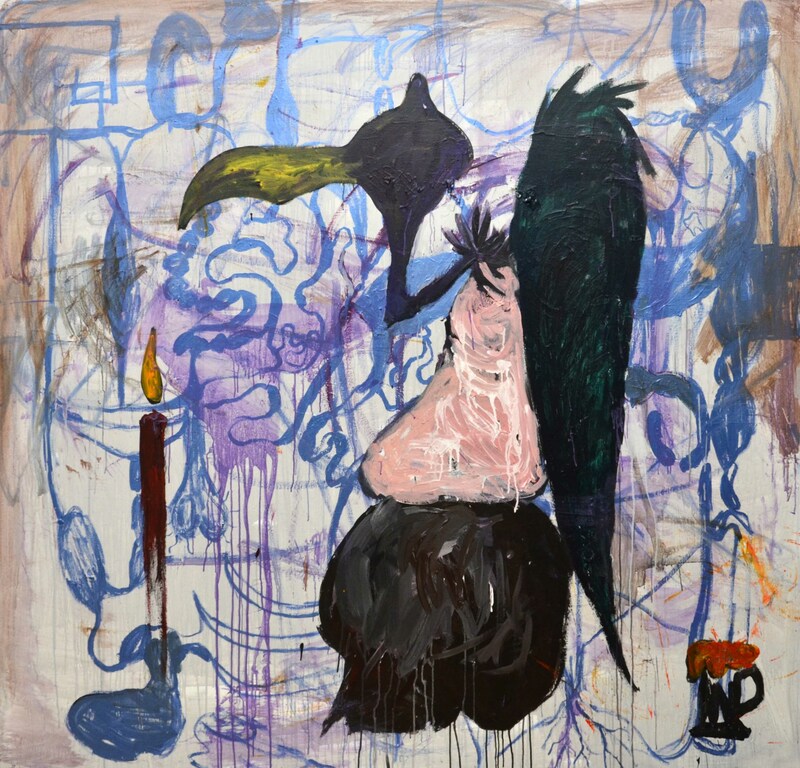 Ocampo’s current exhibition at Tyler Rollins Fine Art has as its dominant motif the figure of a buzzard, which acts as a stand-in for the artist, a cultural scavenger. Perched atop a skull, holding a light bulb in its beak, and flanked by a lighted candle and foaming beer stein, the buzzard parodies traditional artistic conventions of the still life and memento mori as well as the tropes of artistic inspiration. 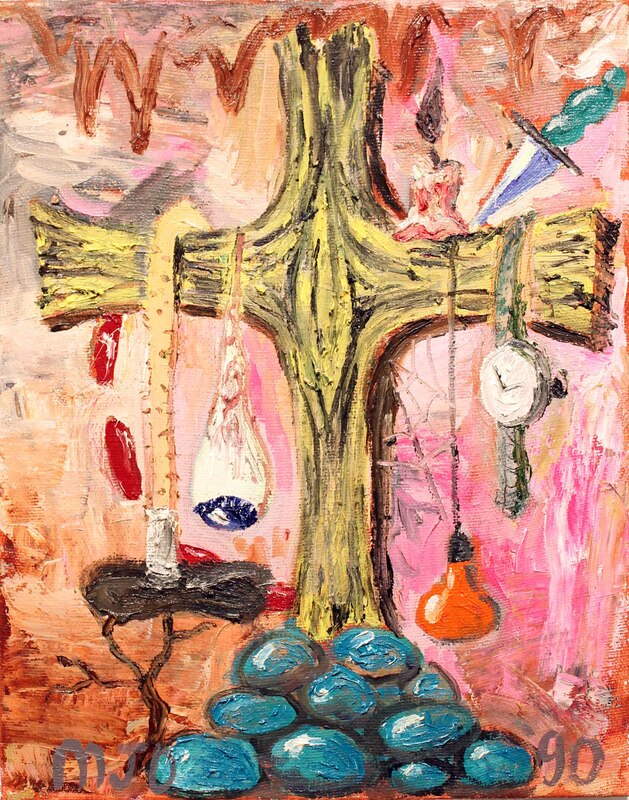 The still life genre continues with a group of smaller canvases, some featuring the buzzard motif or floral arrangements approached as studies in form and color, while others relate to Ocampo’s ongoing series of quasi-religious, highly idiosyncratic icons featuring crosses along with the artist’s familiar motifs of sausages, candles, light bulbs, and body parts. 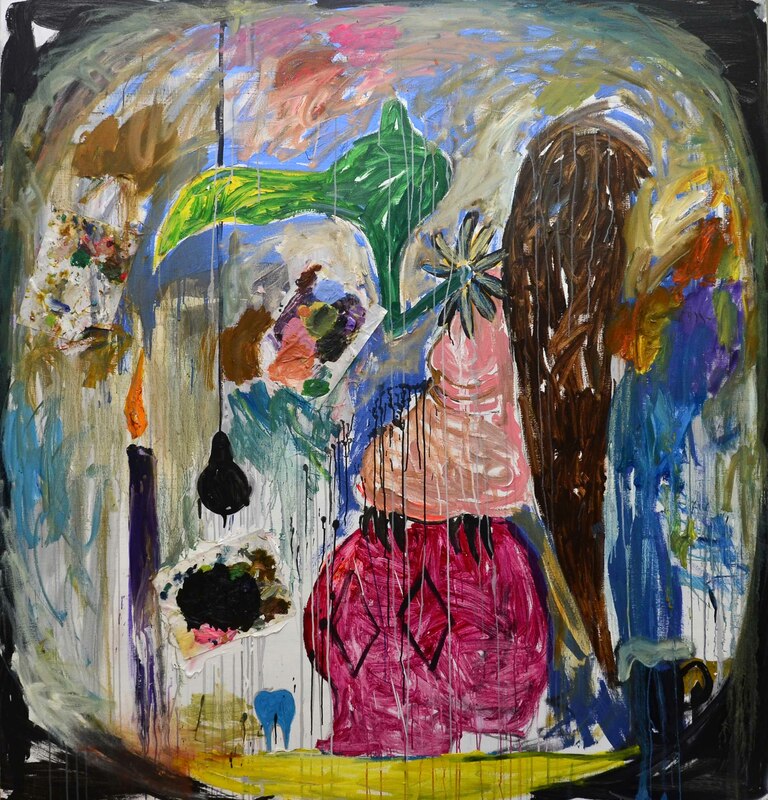 With another group of works, Ocampo creates layered compositions of canvas and plexiglass, a technique he uses here for the first time. 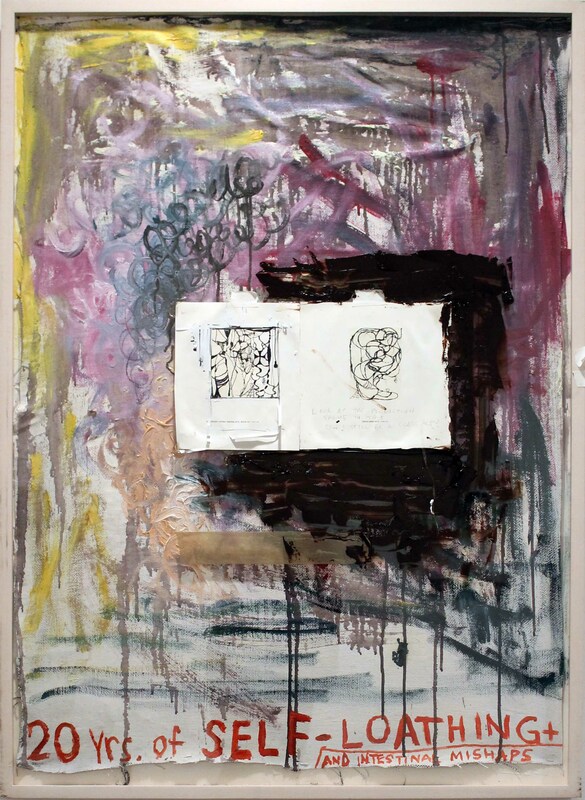 Sometimes he paints on the surface of the plexiglass or collages elements on top of or underneath it with clippings from art publications, paint palettes, and cigarette butts, elements that are also seen in the large buzzard paintings. Ocampo foregrounds elements of the painting process that are not normally seen, such as his paint palettes, a sock that he used to wipe his brushes, or the screws used to hang the paintings (many of which appear throughout the salon-style hanging of the smaller paintings, with some actually driven into the surfaces of the works). 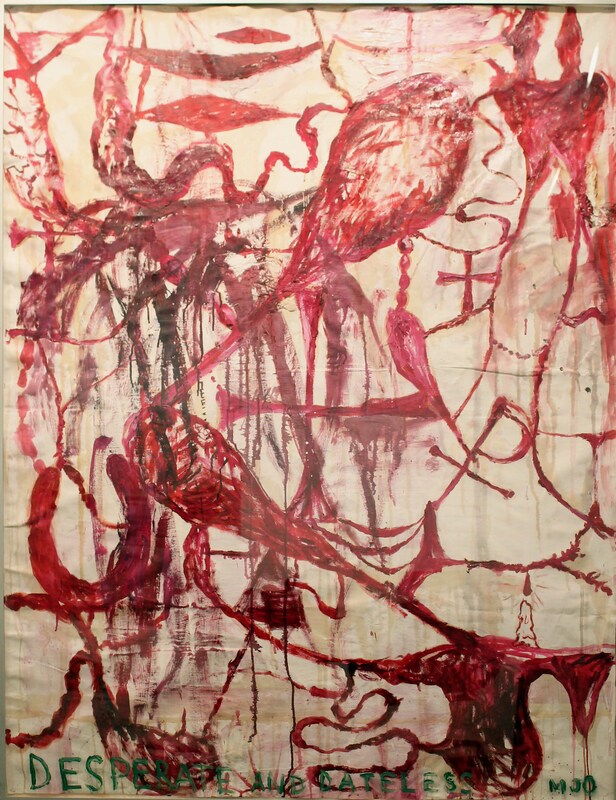 The exhibition is completed by a large mural (done in “Pepto Bismol pink”) of sinuous intestines enveloping various motifs of the exhibition and inspired by the works of Brice Marden and Jackson Pollock. 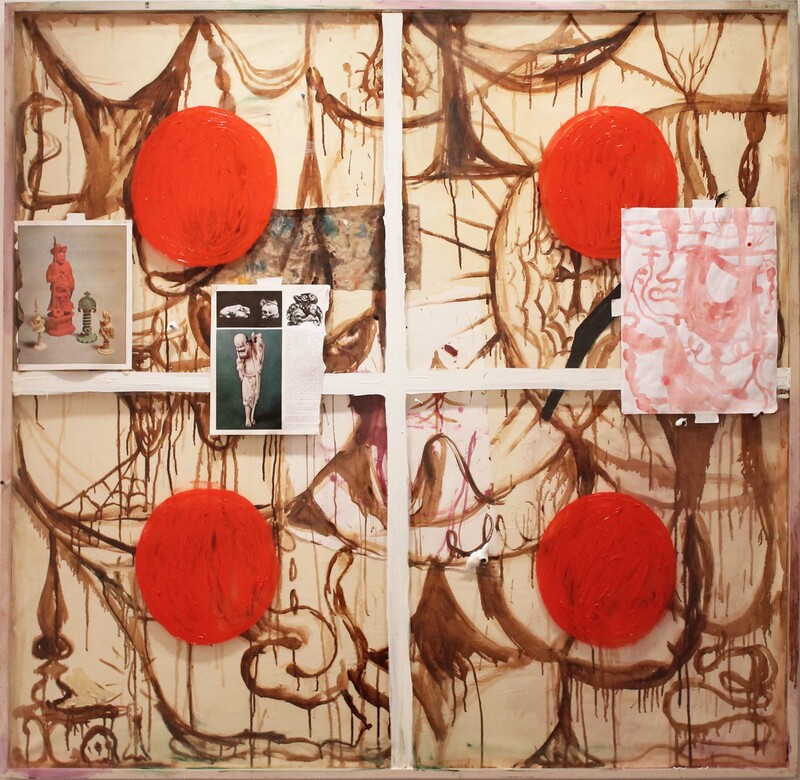 Ocampo plays with notions of artistic inspiration, originality, and the anxiety of influence – even going so far as to sign many of the paintings with the initials “FK” of his fictional alter ego, Francis Krippendorf, a purportedly mentally insane figure residing in Luxembourg, where Ocampo’s European studio is actually located. 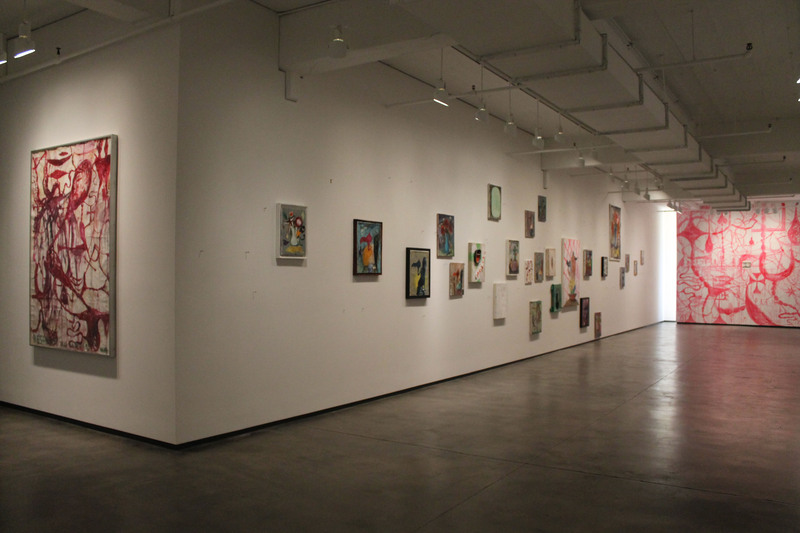 Concurrently with his gallery show, Ocampo has curated a group exhibition of Manila-based artists, entitled Bastards of Misrepresentation, taking place in November and December (2012) at several New York venues, including the Queens Museum, TOPAZ Arts, and Crossing Art.